It's the most controversal issue in modern American history. Did Lee Harvey Oswald kill John Kennedy by himself, or did a conspiracy do it? And if a conspiracy did it, did the conspiracy include Oswald? If you are like most Americans, you believe that a conspiracy killed Kennedy. And if you are like most Americans, you have mostly heard one side of the story. 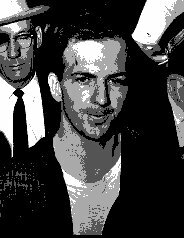 This web site is dedicated to telling the other side of the story -- to presenting evidence that Oswald acted alone. You may not want to hear that side of the story. It's really a lot of fun to believe that there was a conspiracy. But if you are interested in hearing the "other side" of the story, then this is the place to be. Regardless of what you believe, several web sites, mostly conspiracy-oriented are worth checking out. What about those witnesses? What about the Tague wounding? Who was the "Umbrella Man?" Was there a shooter from the Grassy Knoll? Was the rifle recovered really a Mauser? What sort of person was he? Did he really have "Top Secret" security clearance? Did he shoot at General Walker? Was the man exhumed in the late 1970s really somebody besides Oswald? Did Oswald really share an office with Guy Banister? Did Clay Shaw really conspire to kill Kennedy? Why did Oliver Stone make a movie about the Shaw trial and not even mention Perry Raymond Russo? Did David Ferrie die a "mysterious death?" Did the bullet that hit Kennedy in the back penetrate only an inch and fall out? Was Kennedy hit in the head by a bullet from in front? Are the autopsy photos and x-rays faked? Did all the doctors at Parkland Hospital believe that Kennedy was hit in the front of the neck, and if so are their opinions decisive evidence that that is what happened? Did you know that all the evidence in this case proven to be forged has come from the conspiracy side? Did you know that the "mysterious deaths" are virtually all not so "mysterious" when you look at them closely? Do you trust authors like Mark Lane to tell you the truth about what witnesses said? One of the more interesting parts of the LaFontaines' new book Oswald Talked concerns Sylvia Odio. Where traditional conspiracy authors have taken her account at face value, the LaFontaines' have "upped the ante" with their new interpretation of the evidence. Researcher Steve Bochan takes issue with their logic and use of evidence in part one and part two of this critical essay, first posted on the newsgroup alt.conspiracy.jfk.moderated. Must reading if you have read Oswald Talked. Recent media attention was focussed on a film shot in Dealey Plaza, at the time of the assassination, by Patsy Paschall. Does the film show evidence of a shooter on the Grassy Knoll? Dallas researcher Greg Jaynes, in this essay, gives a thorough rundown of the films content. A common theme in conspiracy books is that Oswald was "denied counsel" when in the custody of the Dallas Police. The real story is more complex, and tells us a lot about just how Lee Oswald thought. Oswald, in His Own Defense, an essay by Joel Grant and John Locke, explores this issue. Rose Cheramie is one of the people who supposedly had "foreknowledge" of the assassination. Her story is in all the assassination books, but British author Chris Mills has collected new primary sources. His Rambling Rose is an essay that takes us beyond the usual treatment. Mills believes she may have had actual foreknowledge of the assassination, and offers a particularly strong treatment of her death. Conspiracy buffs are ever suspicious of the "official story" and "government propaganda." In at least one case, however, many have been crudulous toward a piece of propaganda from a very different source. Farewell America is a book whose origins are explored in this essay by John Locke. Just how many different people have been accused of being (or have confessed to being) either a shooter or an accomplice in Dealey Plaza? Researcher David Perry has compiled the most complete known list. His Rashomon to the Extreme! is that list. Of the 61 people on this list, at least one is guilty. ©1994 by Perry, and posted here with permission. Did chance and circumstance converge to bring John F. Kennedy into the sights of Lee Harvey Oswald, or was Kennedy guided to Dallas and down Elm Street by some sinister forces? In the essay The Three Furies, Joel Grant examines the forces that brought Kennedy to Dallas and down Elm Street. Is this conspiracy, or politics? John Locke's FAQ (Frequently Asked Questions) outlines the evidence, from the perspective of a person who believes Oswald did it alone. A good briefing for someone who has only read conspiracy books, and wants the other side of the story. Frequently posted on ALT.CONSPIRACY.JFK, it's here for your reference. Contact your Systems Administrator. Most Systems Administrators will add a group if you merely ask. Read the group on the excellent service zippo.com. You can read the group, and post messages, for free. However, for a modest fee you can get a very extensive package of Usenet services. An excellent and innovative service. Point your newsreader to cherub.sewanee.edu, a publicly accessible NNTP server that carries the group. Both reading and posting are allowed. Alternatively, point your newsreader to news.uni-stuttgart.de, a publicly available NNTP server that carries the group, but does not allow posting.